Australian rugby union footballer Israel Folau has been lambasted for saying that gay people are doomed to go to hell. Folau is again in trouble for a new homophobic comment on Instagram that may have gone too far. The conservative Christian athlete posted a cartoon about “God’s plan” on his profile which led to one of his followers asking what God’s plan was for gay people. 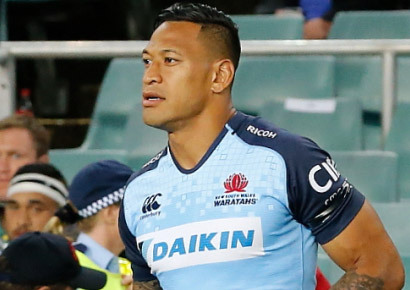 The statement did not go down well on social media and has also come under fire from Folau’s rugby bosses and sponsors. It’s been reported that Rugby Australia (RA) and his team, the New South Wales Waratahs, will be having words with the player. “Israel’s comment reflects his personal religious beliefs, however it does not represent the view of Rugby Australia or NSW Rugby,” stated Rugby AU CEO Raelene Castle. “We are aligned in our view that rugby is a game for all, regardless of sexuality, race, religion or gender, which is clearly articulated in Rugby’s inclusion policy,” she said. Alan Joyce, the openly gay CEO of Qantas Airways, which backed Australia’s successful marriage equality campaign and sponsors the Wallabies, is said to be putting pressure on the team to take action against Folau. There have also been calls for the airline to consider dropping its sponsorship over the comments which appear to be in violation of RA’s inclusion policies. “We’ve made clear to Rugby Australia that we find the comments very disappointing,” a Qantas spokesman said. Former New Zealand immigration minister Tuariki Delamere has joined in the chorus of criticism and said that Folau’s remarks could lead to him being refused entry to the country. “There can be no doubt that he is a threat to the public interest and a threat to the public order,” Delamere argued. Roberto is a writer, content creator and would-be novelist who's passionate about equality, justice and freedom.